U.S. Secretary of State Colin Powell said Monday that the United States will play a leading role in helping Iraqis recover antiquities stolen by looters from Iraqi museums in recent days. After a meeting with Kuwaiti Foreign Minister Mohammed Al Sabah, Powell said the effort also would involve restoring antiquities that were damaged. Powell said he is seeking cooperation with the European Union and UNESCO, the U.N. Educational, Scientific and Cultural Organization. Contacts also have been made with Interpol, the international police agency. State Department spokesman Philip Reeker said the American people value the archaeological and cultural heritage of Iraq, documenting over 10,000 years of the development of civilization. This kind of looting "causes irretrievable loss to the understanding of history and to the efforts of Iraqi and international scholars to study and gain new insight into our past," he said. Maxwell L. Anderson, president of the Association of Art Museum Directors, called on museums and collectors around the world not to acquire antiquities stolen from Baghdad. 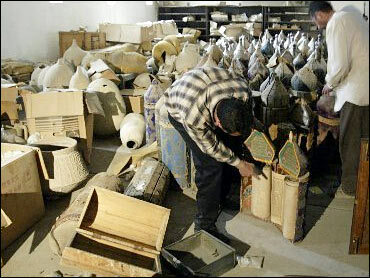 The association urged all collectors to pass on information leading to the recovery of artifacts to appropriate authorities.